Growing just 24-36 in. tall, this mophead type fits into small spaces and containers! From midsummer to fall, it produces loads of pink flower heads against dark green foliage. Blooms on new and old wood, so they'll be plenty of flowers to admire and attract butterflies and pollinators. Flower heads make lovely cut flowers. Hydrangeas are classic flowering shrubs that add charm and summer color to the landscape. 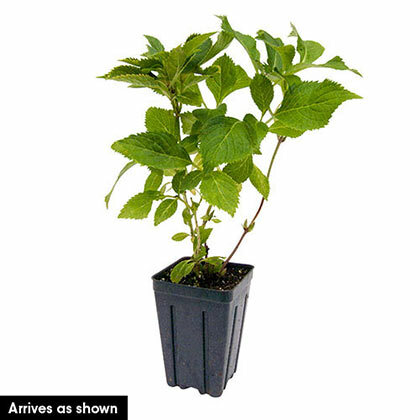 Performs best when planted in full sun to partial shade. Potted. Zones 4-8. FoliageSimple, elliptic to ovate, dark green leaves. Flower FormLarge, mophead, soft pink flowers with an open, heart-shaped form. BloomsMid to late summer and into fall. PruningAfter flowering, prune to remove dead and broken branches, and to maintain a desired size. 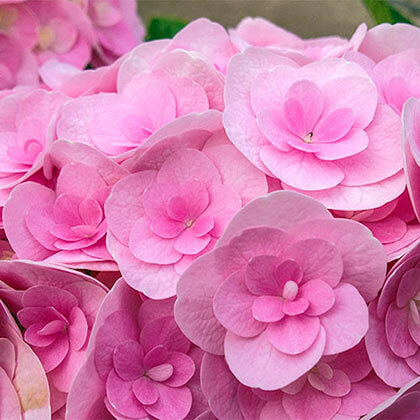 CommentsEnjoy an abundance of soft pink blooms from this Hydrangea with major flower power! Blooms on both old and new wood. Love has received a gold medal at the National Plant Show (UK) and a silver medal at Plantarium 2013. DepthDig a hole twice the size of the container and plant at the same level it was growing at in the container.